"I Shall Comply No More Forever, Or Until …." Only you own your life, your property, your thoughts and your labor and all is sovereign to that which is you. You are not a pawn that can be battered about at someone else's will, or a whim, or for entertainment, or for the pure exercise of absolute power. You are not a slave to the collective, or the elite and you owe nothing to humanity other than which you choose to give, as a free spirit, endowed with free choice. Your only responsibility is to take care of yourself and those in your charge and to treat others with the same respect and dignity, as you desire to be treated. "I was born a sovereign. No one owns my body or my soul. Not a person, not a group and certainly not a government or a nation because neither of these are the cause of my existence. My allegiance to that nation is my voluntary choice." "Although I am part of a nation, by nature I am a free spirit and that free spirit belongs to me and no one else. The nation of which I am a part does not own me and I only owe that nation what I choose to give freely and of my own volition. I only do so because I believe that nation shares my code." "I choose to live by the code of honor, integrity and justice. When that nation of which I am a part ceases to be honorable and just, I withdraw my allegiance to it and will resist that nation with all my heart and soul because that nation no longer shares my code and has destroyed the trust of the people and broken the bonds on its power." "I choose to live in peace until such time that my local environment or the government will not allow me to live in peace. I have determined that government will no longer allow me to live in peace and I now must fight government." "I find that the American government, at every level, has shattered the trust of the people and broken the bonds on its power with malice, in pursuit of absolute power over the masses. Government has become corrupted by special interests and international ambitions, has abused its power and no longer represents the true interests of the once-free American citizen in a sovereign land. Government has become almost a virtually lawless heavily armed police force for absolute control and has ceased to preserve, protect and defend the Constitution of the United States and the individual freedom of its citizens as is its fundamental duty and obligation. I further find that the solemn oaths taken by the operators of the American government, at every level, with the pledge to fulfill that duty and obligation, are hollow and without substance. These are harsh allegations, but those concerned individuals who have watched the steady degradation of America over the last 100 years, know the charges are true." "Consequently, I shall comply no more forever with this nation, or until ….."
*	All agencies of government, at every level, start abiding by constitutional and statute law and that government, at every level, will clean up and sunset archaic law and remove conflicts, confusions and ambiguities from existing law. *	Constitutional law is adhered to by every level of government, according to the original intent of the Founding Fathers. *	All politicians, judges, bureaucrats and government employees shall be bound by and comply with the same laws that apply to every American citizen. *	All politicians, judges, bureaucrats and government employees make a solemn pledge to the American people to remove waste, fraud, abuse and corruption from all government agencies by all means possible. *	All American taxpayer funding to the United Nations ceases and the UN headquarters is sent to Europe where it belongs. 191 of the 192 nations belonging to the UN act against the interests of America and yet America funds 22% of the UN budget. *	All benefits of any kind and nature are terminated to any and all illegal aliens who have broken our laws by coming here without the operation of law. The borders are closed once and for all. A clear and unambiguous government policy should be aimed at self-deportation for illegal aliens by enforcing current law. No comprehensive immigration law is required. The 14th Amendment should be revised by U. S. Supreme Court action or by Constitutional Amendment to eliminate the Anchor Baby interpretation. *	The Obama Health Care law is repealed and a constitutional replacement implemented that recognizes and adopts as an absolute mandate, the doctor - patient relationship and a free market solution to health care. All health care insurance can be sold across state lines and personal-injury lawsuits will be severely limited by law in health care cases. There shall be no collection of private medical data by any government agency whatsoever. *	The Internal Revenue Service, the Internal Revenue Code, the Federal Reserve and the 16th Amendment are repealed and a simple constitutional replacement for taxes and national banking are implemented. The IRS and the Federal Reserve are way too powerful. *	The American judicial (court) system is based on constitutional common law and precedent law is abolished. The Cannon of Ethics should be revised such that the attorney's allegiance is solely to the client and not the court system as it is now. Remove the current legal impediment to citizen grand juries. 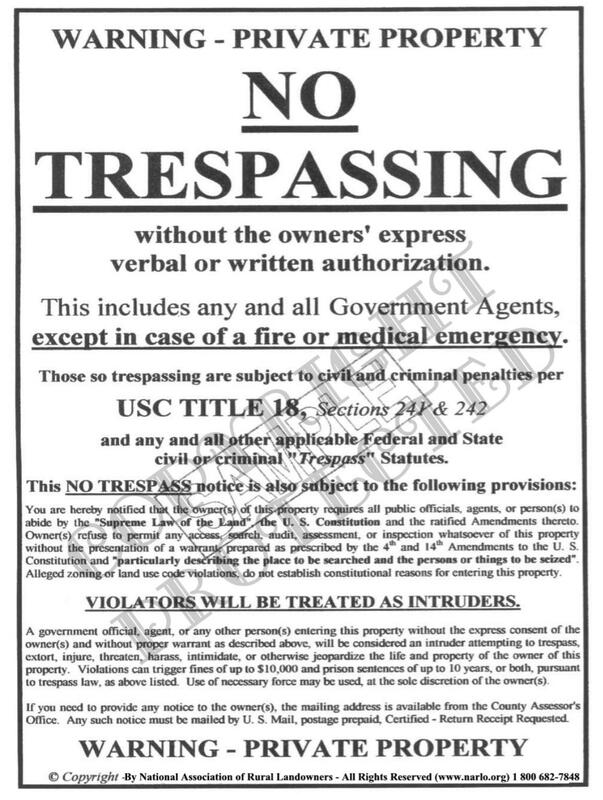 *	Environmental law, local, state, or federal, is codified to be subservient to constitutional property rights as literally defined by the Founders under the 5th Amendment to the U. S. Constitution where compensation for ANY and ALL taking of private property is fully paid by government at a true and fair market value at its current zoning at time of declaration of eminent domain. *	Violations of the true intended purpose of eminent domain are eliminated. Government shall be prohibited from invoking eminent domain to increase the tax base from property, as that was not the original intent of the Framers of the Constitution when inserting the eminent domain clause in the 5th Amendment. *	The federal government implements a balanced budget by law, except in time of war. *	All foreign aid, of any kind and nature to any foreign government, is only paid when fully authorized by Congress and administered by U. S. authorities in country. *	Congress shall approve all wars, no matter where or for what reason. A clear threat to national security will be dealt with harshly by an act of Congress, either nationally or on foreign soil, and enforced by the president, with the full power of the American military. The only solution to foreign aggression is the fear of our rapid retaliation with a massive force. Don't fight a single war without the full intention of winning them decisively. *	Every single entitlement or government welfare program shall be rolled back over a time certain (10 to 15 years) such that the trend will be a steadily shrinking budget item. It is high time Americans returned to self-reliance and stood on their own feet again. For those who, through no fault of their own, are seriously ill or disabled, should be supported by limited government programs. Those with two arms, two legs and a reasonably functioning brain do not deserve help from the taxpayer. Life is tough and it is about time the population began to re-learn that lesson. Subsidizing the able bodied weakens the individual and the fabric of a nation. *	Several Federal Cabinet Level bureaucracies are to be abolished. Among those to be abolished are to include but not limited to the Environmental Protection Agency, the Department of Energy, The Department of Education, the Labor Department and the Housing and Urban Development. These services should be a function of the individual states. * Criminals serve their full sentences with no plea bargains or parole. Criminals judged to be a danger to society after serving a full term, will be forced to live under strict supervision after release from prison until their threat to society has passed. *	Public education and the curriculum are removed from federal control and returned to state and local government control and teacher's unions are not allowed to blackmail local governments into signing egregiously lucrative contracts that break the backs of the taxpayer. *	No voter shall be allowed to vote without first registering at least 30 days before any election with proof of U. S. citizenship and provides legal identification at the voting booth prior to being allowed to vote, without exception. Provisional ballots and election-day registration are to be eliminated. "I make this pledge without reservation and of my own free will." There are more things we could add to the list, but the point has been made. We do not intend to go quietly into the night like good little compliant robots. Until these things we have listed come to pass, we stand in opposition to government. Pursuant to the Judges decree, as a Belligerent Claimant, we are committed to preserve our rights through FIGHTING and COMBAT if necessary, by resisting every effort by government to subjugate us by law, or by force of arms. In addition to our above pledge, part of that resistance is setting up an organization to fight corruption in government. That organization is known as the "Exclosers" (from EXpose and DisCLOSE) and it is dedicated to rooting out corruption in government wherever it is found with the sole purpose of restoring trust in government and our institutions. If you feel that you must be a Belligerent Claimant in order to preserve, protect and defend your individual rights as the judge has decreed, OR, if you wish to no longer comply until government restores the trust in the people and reduces its power to those limits placed upon it by the U. S. Constitution, please join those of us who are doing more than just talking, we're acting!